The Mast Camera (Mastcam) on NASAs Curiosity Mars rover captured this mosaic as it explored the clay-bearing unit on February 3, 2019 (Sol 2309). This image acquired on January 26, 2019 by NASAs Mars Reconnaissance Orbiter, is part of a campaign to image potential impact craters in the south polar layered deposits (ice cap). This image acquired on January 27, 2019 by NASAs Mars Reconnaissance Orbiter, reveals small-scale shapes that often correlate with mineral units and provides information about stratigraphy. This image acquired on January 23, 2019 by NASAs Mars Reconnaissance Orbiter, shows some of the geologic diversity of Mars. This image acquired on January 19, 2019 by NASAs Mars Reconnaissance Orbiter, shows the rapid changes in the south polar residual cap of carbon dioxide ice. This image acquired on January 27, 2019 by NASAs Mars Reconnaissance Orbiter, shows the extensive central peak complex of Hale Crater. This image acquired on January 10, 2019 by NASAs Mars Reconnaissance Orbiter, shows large gullies on both the pole- and equator-facing slopes. This image acquired on January 25, 2019 by NASAs Mars Reconnaissance Orbiter, shows Ius Chasma, a major section of the western portion of the giant Valles Marineris trough. This image acquired on January 21, 2019 by NASAs Mars Reconnaissance Orbiter, shows the south polar layered deposits are well illuminated to accentuate the topography. This image acquired on February 7, 2019 by NASAs Mars Reconnaissance Orbiter, shows Mawrth Vallis, a place on Mars that has fascinated scientists because of the clays and other hydrated minerals detected from orbit. This image acquired on January 23, 2019 by NASAs Mars Reconnaissance Orbiter, shows the western portion of a well-preserved (recent) impact crater in Ladon Basin. This image acquired on December 11, 2018 by NASAs Mars Reconnaissance Orbiter, shows a surface texture of interconnected ridges and troughs, referred to as brain terrain, found throughout the mid-latitude regions of Mars. This image acquired on January 13, 2019 by NASAs Mars Reconnaissance Orbiter, shows a cluster of dust devil tracks on the flat ground below the south polar layered deposits, but none on the layers themselves. This image acquired on January 20, 2019 by NASAs Mars Reconnaissance Orbiter, shows a chaotic jumble of bright layered sediments, perhaps resulting from large landslides. This image acquired on December 9, 2018 by NASAs Mars Reconnaissance Orbiter, shows a recent impact in Noachis Terra in the southern mid-latitudes of Mars. 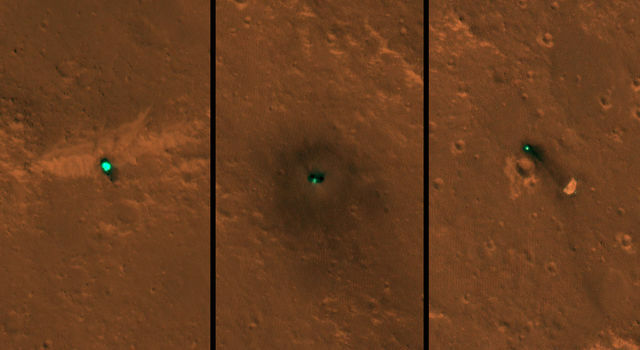 NASAs InSight spacecraft and its recently deployed Wind and Thermal Shield were imaged on Feb. 4, 2019, by the HiRISE camera aboard NASAs Mars Reconnaissance Orbiter. This image acquired on December 5, 2018 by NASAs Mars Reconnaissance Orbiter, shows ripples in the sand which tell us which way the wind was moving and how it was diverted around these rock formations. This image acquired on September 29, 2018 by NASAs Mars Reconnaissance Orbiter, shows many sand dunes are visible. They have an elongated crescent form and are called barchan dunes. This image acquired on December 15, 2018 by NASAs Mars Reconnaissance Orbiter, shows a cross-section of a complex crater in Terra Cimmeria. This image acquired on December 3, 2018 by NASAs Mars Reconnaissance Orbiter, shows a cross-section of a dune field. Dune shape depends on several factors, including the amount of sand present and the local wind directions. An annotated image of the surface of Mars, taken by the HiRISE camera on NASAs Mars Reconnaissance Orbiter (MRO) on May 30, 2014. The annotations display the locations of NASAs InSight lander, its heat shield and parachute. This image acquired on November 3, 2018 by NASAs Mars Reconnaissance Orbiter, shows Asimov Crater, located in the southern ancient highlands of Mars. This image acquired on September 30, 2018 by NASAs Mars Reconnaissance Orbiter, shows slope streaks which are small avalanches of dust and sand from the hillsides. This image acquired on September 18, 2018 by NASAs Mars Reconnaissance Orbiter, shows araneiform terrain (colloquially: spider-like terrain) located in the south polar region of Mars. This image acquired on August 1, 2018 by NASAs Mars Reconnaissance Orbiter, shows the Martian south polar cap full of pits that make it look like Swiss cheese. This image shows the surface of Mars, taken by the HiRISE camera on NASAs Mars Reconnaissance Orbiter (MRO) on May 30, 2014. The contrast has been enhanced in this image to better show the region where InSight landed on Nov. 26, 2018. 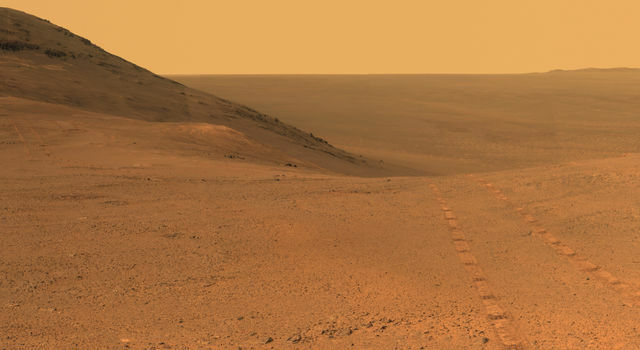 As the skies above Opportunity continue to clear, engineers at JPL are increasing the frequency of commands asking the solar-powered rover to communicate with Earth.